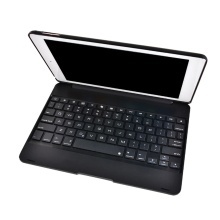 Slim, Comfortable, USB Rechargeable, Wireless BT 3.0 keyboard, protective case, tablet stand for ipad air2 and ipad pro 9.7, with optimized key design for comfortable typing experience, the thickness of key only 15mm, super light for carry. ABS case matched with iPad-mini. Chiclet keys with scissor structure design. Let your iPad change into a laptop in seconds. 360 degrees to fully protect iPad from damage. Intelligent Dormancy Saves Energy Consumption, Protection Battery.